Day Six of the Paul Manafort trial is in the books. It’s a day that featured testimony from just one witness, Rick Gates, Manafort’s longtime deputy, who finished his direct questioning from prosecutors and underwent a grueling cross-examination from lead defense attorney Kevin Downing. [post_ads]Gates proved essential to prosecutors’ attempt to tie Manafort to the dozens of foreign bank accounts in Cyprus, the United Kingdom, and St. Vincent and the Grenadines where he allegedly hid millions of dollars of taxable income from the IRS for nearly a decade. Through emails and documents submitted into evidence Tuesday, Gates explained how he and Manafort enlisted the help of a Cypriot lawyer — referred to in court as “Dr. K” because his name, Gates said, was hard to pronounce — to create “shelf” companies to receive payments from Manafort’s various Ukrainian political clients for their work. Gates and Manafort first met with Dr. K to set up the companies in 2007 in Cyprus, Gates testified. Cypriot shelf companies are created in such a way that they do not leave a paper trail for the controlling client — in this case, Manafort. Four employees at Dr. K’s firm established and named the entities — Leviathan Ltd. and Peranova Ltd. are two of the more high-profile examples — where Manafort and Gates held millions of dollars of payments to Manafort’s Davis Manafort Partners (DMP) and DMP International from their overseas political clients. The names on those accounts belonged to the four individuals who created them. Manafort and Gates left no fingerprints. Gates said it was a “very common method” for Dr. K and that, once the money was moved into the accounts, Manafort decided what to do with it. Manafort never disclosed the existence of these foreign accounts to his bookkeeper or tax preparers, the jury was told by multiple witnesses Monday and last week. Gates undermined another of the defense’s main arguments: that Manafort did not have the time to pay attention to his day-to-day expenses and personal finances. 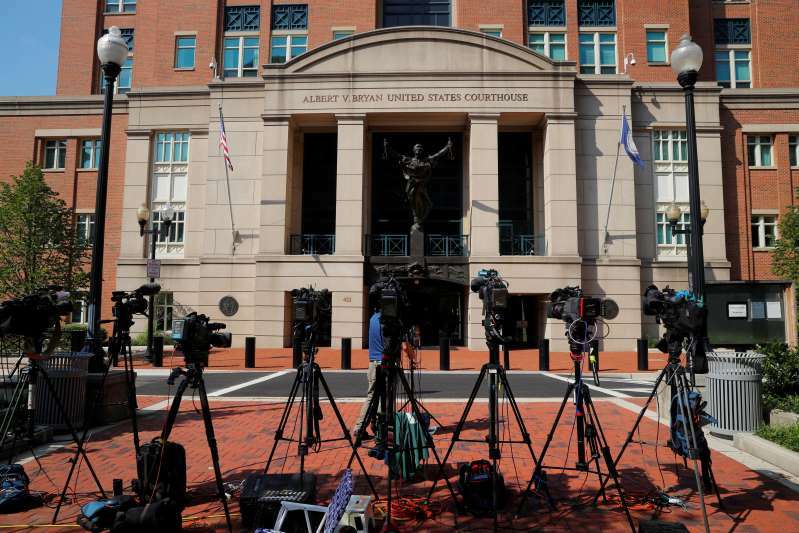 The prosecution flashed a December 2011 email on the TV screens in the Alexandria, Virginia, courtroom Tuesday between Gates and Manafort about a wire transfer. In the email, exchange, Gates tells his boss he plans to wire money from Leviathan — one of Manafort’s many Cypriot shelf accounts — to the U.S. At the email, he asks for Manafort’s permission. “Yes, this is approved,” Manafort responded. Gates testified Tuesday that this was standard practice. Manafort would ask him to make payments to various vendors or bank accounts in the U.S. and abroad. When Gates had prepared the transaction, he would run the final logistics by Manafort. “There are hundreds of these [emails],” Gates said. As for the bank fraud charges against Manafort, prosecutors presented the most compelling evidence yet that he knowingly inflated his income when applying for loans. DMP International’s revenue stream from Ukraine dried up in 2014 after its main client, former Ukrainian President Viktor Yanukovych, fled to Russia amid a popular revolt. In 2015 and 2016, Gates said, Manafort “requested a team of people to pull together” documents to apply for bank loans in order to keep pace with payments to maintain his luxurious lifestyle. “He requested certain things be changed in some of those documents,” Gates said, including claiming certain properties as primary residences instead of rentals and inflating his income for collateral. In October 2016, for instance, Gates sent Manafort DMP’s profit and loss statement (P&L) from Jan. 1 through June 30 of that year, emails introduced in court Tuesday show. That P&L showed DMP had lost $638,048 in the first half of the year. “How do I convert into non-PDF Word document?” Manafort responded. PDFs are non-editable images of documents. Documents in word-processing applications can be edited. Gates converted the 2015 DMP P&L to a Word document for Manafort, but there were spacing, font, and other discrepancies between that copy and the original. Manafort returned an edited version of the P&L to Gates later that day. The new document showed a net profit of more than $3 million — a $3.6 million shift. Gates sent the revised copy on to the bank. Gates admitted to a litany of crimes Tuesday as Downing, Manafort’s lead defense attorney, hammered him for enriching himself on his boss’s dime, executing tax evasion and bank fraud schemes of his own, and lying to the special counsel’s investigators. The defense is largely staking Manafort’s innocence on discrediting Gates. Gates embezzled hundreds of thousands of dollars from Manafort by filing exaggerated — and at times, completely fabricated — expense reports, Downing forced him to admit Tuesday. The goal of the letter was to coax the Swiss company into investing in Brown’s project as well. “I did it as a favor to Mr. Brown,” Gates said, but not before taking a dig by indicating he had forged similar documents for Manafort. Gates did not raise his voice or appear to lose his cool through the first two hours of cross-examination Tuesday. He has avoided the fierce stare of his former boss sitting arms folded in the defendant’s chair, but his answers have been quick and stated clearly. In fact, he often appeared defiant. He criticized Manafort for choosing to go to trial instead of owning up to their alleged financial deceit. “Mr. Manafort had the same path. I’m here,” Gates said from the witness chair. Gates repeatedly challenged Downing’s characterization of certain events with astonishingly self-incriminating frankness. “It’s not a secret life,” Gates said. His wife is “aware of” the affair and knew about the account where he sent money he embezzled from Manafort, he said. “It was an embezzlement from Mr. Manafort,” he said, with mock finality. Downing told Judge T.S. Ellis III that he plans to cross-examine Gates for another hour Wednesday morning.